This Quick Vietnamese Pork and Riced Broccoli Bowl is the answer to that ever recurring problem of what’s for dinner tonight. They come together in just thirty minutes (less if you have some riced broccoli stored in the freezer), are delicious and satisfying, and make absolutely fantastic leftovers for lunch the next day. I came across a version of this recipe in my recent copy of Eating Well, and after a few modifications it has become a fast favorite in this house. Seriously, we have made Quick Vietnamese Pork and Riced Broccoli Bowls 3 times in the last two weeks, which is just unheard of around here. Even the kids are hooked! Can We Make the Broccoli Bowl Vegetarian? If you aren’t a fan of pork, you can always sub in some tofu in its place, just be sure to give it a good press and marinade it in the sauce for at least 30 minutes before cooking to ensure it still has that great flavor. If you want some proper instructions for how to prepare your tofu, then pop over here and check out this post: Crispy Asian Baked Tofu. 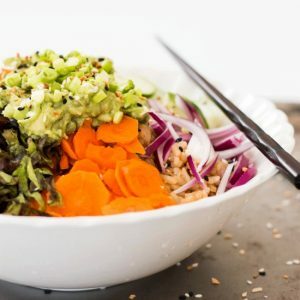 I love to hear from you, so if you try out my Quick Vietnamese Pork and Riced Broccoli Bowl be sure to pop back and leave a comment to let me know your thoughts! Happy Eating. This Quick Vietnamese Pork and Riced Broccoli Bowl is the answer to that ever recurring problem of what's for dinner tonight. They come together in just thirty minutes (less if you have some riced broccoli stored in the freezer), are delicious and satisfying, and make absolutely fantastic leftovers for lunch the next day. Heat 1 tbsp of the avocado oil in a large nonstick skillet over med-high heat. Add in the broccoli rice and a pinch of salt. Cook, stirring occasionally, until softened, about 5 minutes. Remove from the skillet and cover to keep warm. Add to the skillet the remaining 1 tbsp avocado oil and the pork. Cook over med-high heat, about 4 minutes. Stir in the garlic, ginger and a pinch of salt. Cook for one minute. Remove from heat and stir in the herbs, shallot and 1/2 cup of the reserved sauce. To serve: divide the broccoli rice between 4 bowls, top with equal measures of the pork mixture, followed by some of the red bell peppers, carrots, cucumber and peanuts. Serve with the remaining sauce if needed. To make your own broccoli rice pop over here: What is Riced Broccoli and How to Prepare it. I looooove bowl dinners! They are so easy and delicious. The flavors in here sounds fantastic. I’ve had riced cauliflower before, but not riced broccoli. Will have to give it a try! Love how quickly this healthy dinner comes together. 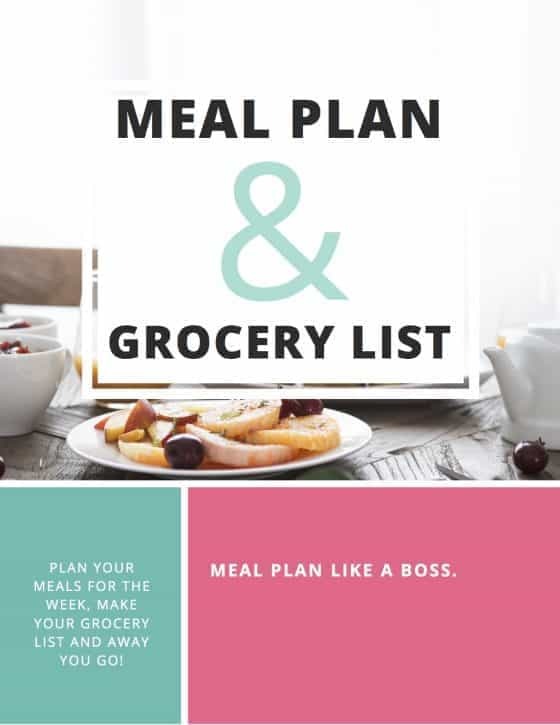 Perfect for busy weeknight schedules! Love that this is a quick recipe! I’m TOTALLY making this for dinner soon. I think it would be so delicious! Yay 🙂 We love it! I love that you include tofu instructions for this recipe! I’ve tried adding tofu to a couple of dishes and it never seems to quite turn out. Can’t wait to give it another try now that I have a better sense of what I’m doing! I can’t believe this gorgeous bowl is ready in 30 minutes! It definitely belongs in the dinner rotation. This looks deliciously crunchy and with the fresh herbs, sublime. Thanks for sharing, count me in! I can imagine why it has easily become a family favorite! I would have it with tofu, but for my husband and stepson, your version with pork is perfect! Thats funny, I actually made it with tofu the other day and it was perfect. I pressed the tofu for a couple of hours to make sure it would soak up the sauce flavors, and it was great! 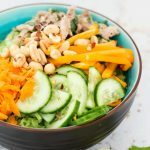 I love bowls like this, they are such a perfect solution for lunch and weeknight dinners! What an incredibly healthy and satisfying meal this is! I’ve never heard of broccoli rice! That’s brilliant!! I’m saving this one. Oh you have to try it! 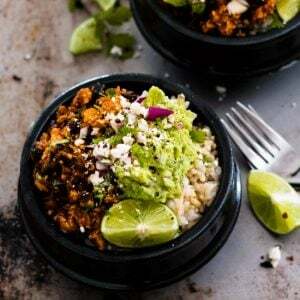 So easy to make and such a great alternative to grains if you want to mix it up, plus the kids (well at least mine anyway) happily devour their greens which is always a huge plus. Oh! I am totally in love with this recipe! I am definitely going to put it on my meal plan soon! Love the idea of the riced broccoli, too!